[caption id="attachment_236" align="alignleft" width="300" caption="RC Battle Tanks"] [/caption] Just like in a real-life battle, strategy and speed is important in order to be victorious. And before engaging in battle, one of the requirements is to make sure that the tanks are fully operational, free of defects and the controls are in perfect condition. And one has to remember that a fully charged tank has more chances of winning over those who will experience a loss of power. At the beginning of the battle, members of the team should start securing key areas in order to dominate the field. This will make every move and maneuver easier for those who are in charge of the controls. Having the units in strategic locations will also help the RC tanks defend themselves against enemy forces. When firing shots, one has to make sure that the target is within firing distance. This will ensure that BBs are not wasted on missed shots. This will avoid unnecessary runs back to home base for ammo reloading. Common problems that arise during these mock battles include mechanical problems. Such occurrences can be a hindrance when a member of your team is out of commission. When enemy forces start to advance towards allied grounds, it would be a wise move to drive straight down the battlefield while engaging those found along the path. Team members can also spread out all the way through the battlefield width to prevent the enemies from moving forward. It would also help to have some RC tank units to stay in the middle of the field to provide cover fire for long range targets. Additional protection like small bushes or trees would also help while advancing towards the preferred firing position. But when an enemy tank moves toward the hiding tank, a face-off like this will cause the RC tank units to be short-lived mainly because other tanks will also start firing towards their direction. 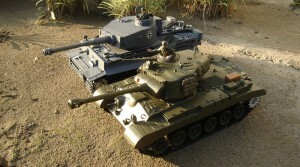 When two tanks meet head on, the most favorable move will be to either go for a J-turn attack or wait patiently for a side shot with a high angle to get on the other tank’s side prior to pivoting and shooting. And almost always, turning full-skid is bound to win the stand-off. During instances when several tanks are found in the same location, a very deadly game may be witnessed. The battlers have to look out for the next moves of the other opponents while planning their own offense. A long range shot from the other team members who are at a safe distance can help alleviate the situation. When driving into close combat, moving quickly could mean saving the difference between victory and defeat. It is a good to remember that in a battle, offense is just as important as defense. With every tank given three lives each, a good amount of both offense and defense will definitely ensure victory at the end of the mock battle especially if team members are working together towards a common goal – conquering the enemy!